Many reviewers liked the Vans Atwood Hi sneakers for being comfortable on the feet. They commended the shoes’ nicely padded collars which protect the wearer in case he is skateboarding, and the board whacks his ankles. A significant number of users were pleased with the “perfect styling” of the high-top shoes which they say look even better in person than in the pictures. The Vans Atwood Hi provides a snug and true-to-size fit according to several testers. They advise people to order their standard shoe size when shopping. The lifestyle high-tops are perfect winter shoes because they’re nicely warm, some purchasers commented. A handful of buyers were pleased with the color selections of the Vans model. 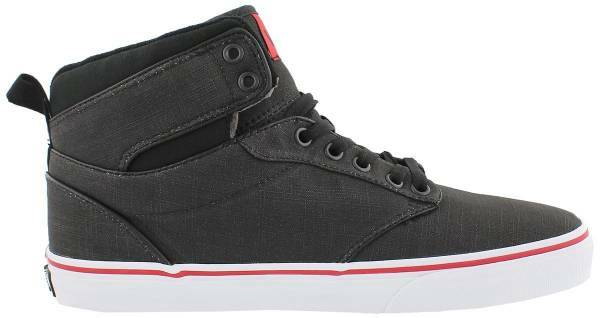 The Vans Atwood Hi feels light, reported a few customers, and not bulky or heavy as the shoes’ profile might suggest. Any marks or dirt on the casual high-tops can be easily washed off with a damp cloth, a couple of consumers noted. The high-top Vans footwear has a good, solid grip according to an individual. He also mentioned that the shoes could be used as a play shoe or for casual, everyday wear. The Vans Atwood Hi shoes displayed poor workmanship, complained many users. They reported soles detaching from canvas uppers to holes developing on the fabric even with casual use in as little as a week from purchase. The Vans Atwood Hi are nicely-styled shoes that are perfect for cold weather due to their warm construction. The high-tops have comfortably padded collars, a true-to-size fit, and a lightweight build. They are also easy to clean, and the soles of the shoes give a good grip on many surfaces. However, the high-top sneakers are poorly built, leaving many users disgruntled at the low quality of the shoes. The Van Doren Rubber Company, which was later shortened to Vans, started out in 1966 in Anaheim California. When the company was just starting out, they did not have any inventory at all aside from three pairs of shoes that were on display. Customers would put in an order in the morning, the owners would manufacture the shoes, and the customers would come back later in the afternoon to get their ordered items. In the beginning, the company would do everything to sell shoes that even if the customer asked for a size eight on one foot and a nine on the other, they would do it with no extra charge. The tide turned for the company and for the better in just a few short years. Although the first Vans footwear, now known as the Authentics, wasn’t made with skateboarding in mind, they still became popular with the local skateboarding community in Santa Monica and Venice. During the 70s, skateboarders noticed that the rubber soles of the Vans shoes stuck well to their skateboards. Some of these skateboarders included the Z-Boys’ Stacy Peralta and Tony Alva who found the Vans sneakers the most functional shoes out there for skateboarding. The company quickly realized the potential of this market and by the mid-70s produced their first dedicated skate shoe—Style #95 or the Era. Vans has, since then, gone on to become a global name. They have produced numerous silhouettes, not only for skateboarding but also for other sports as well. Dressed up or down, the Vans Atwood Hi would work for you no matter what your style is. For a stylishly casual look, pair the shoes with jeans, a hoodie, and a denim jacket. For a smarter setting, add a bit more tailored look to your outfit by matching your high-tops with simple jeans, a crisp white button-up shirt, and a low-key parka on top. The Vans Atwood Hi is available in men’s sizing which ranges from 6.5 to 13. Half sizes are offered as well. The high-cut profile of the sneakers gives a more snug fit and enhanced ankle support. The Vans Atwood Hi features a head-turning old-school sporty vibe but what makes these shoes noteworthy is how comfortable they are on the feet, whether you’re using them casually or doing flips on your skateboard. The Vans Atwood Hi sneakers feature canvas uppers, grippy and vulcanized rubber waffle outsoles, padded collars and tongues, and metal eyelets. The Vans Atwood silhouette is also available in mid- and low-cut profiles.